Sometimes I'm just not in the mood to spend a lot of time on my hair. But at the same time, I don't want to look like a homeless hairdresser when I go to work, so I try to make my ponytails as fancy as possible. -Put your hair in a ponytail like you normally would. -Take a small section of hair at the bottom of the ponytail and wrap it around the elastic. -Secure with bobby pins and hairspray. -Take a small section of hair at the bottom of the ponytail and do a regular three strand braid. -Wrap the braid around the elastic. -Section out all of the hair from your ear forward on one side of your part, and clip everything else aside for later. -Proceed to braid up the side by your ear. 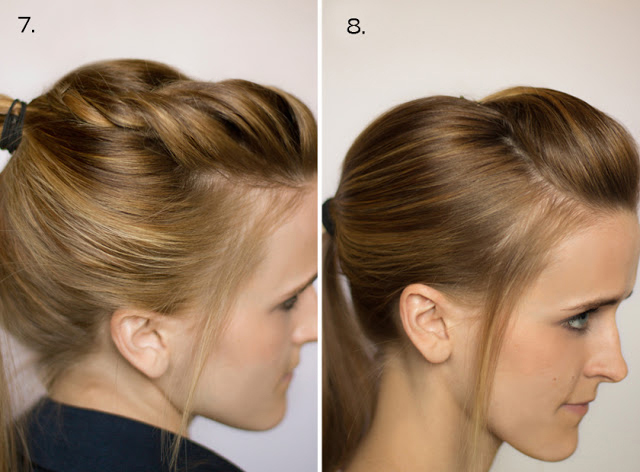 You can do one braid, two braid, or even three if your hair is thick enough. You can also do any type of braid - fishtail, regular, twist braid, whatever you want. -Once your braids are complete, combine them with the remaining hair and put it in a ponytail as you normally would. 4. Add some texture on top. -While your hair is still down, backcomb the top section of your hair. -Using a wax or hairspray, run some product through the top of your hair with your fingers to add texture. -Put your hair in a ponytail as you normally would, being careful not to flatten or mess up the top section. -After your hair is secure, you can also pull up slightly on the top to add more body. -Decide where you want your part. For a retro look, the part should be deep to one side. -Section out the deep side of your bang area for later, and put everything else in a high ponytail. -Curl the ends of the ponytail slightly and backcomb it a little at the base for more body. -Brush softly through the curls for a more retro look. 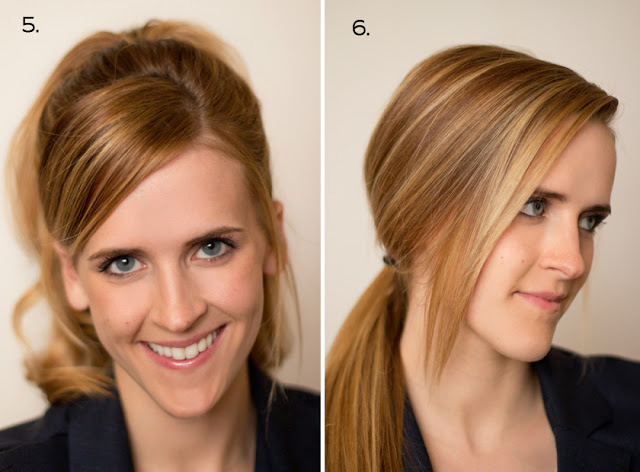 -Shape your bangs into a swoop bang and either tuck them behind your ear or pin the hair beneath your ponytail. -Flat iron your hair and apply smoothing serum for a more polished look. -Part your hair to one side. 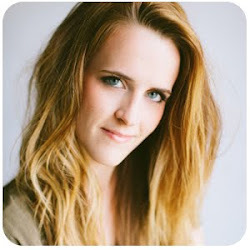 -Backcomb slightly at the base of your bangs for more body. -Loosely put your hair in a low ponytail in the back, making sure everything is soft and smooth. -On the heavy side of your part, section out a 2-3 inch section that goes back to the middle of the top of your head. -Clip everything else aside for later. -With your bang section, you can do a french braid or a twist. It helps to backcomb it first for more body. -Once your braid/twist is complete, combine it with the rest of your hair and put it in a ponytail as you normally would. -Use your fingers to section out an area of your bangs however big you want your pompadour to be. -loosely pin it back, being careful not to flatten it. -Put your hair in a ponytail as you normally would. -Put all of your hair in a low, loose ponytail. -Once the elastic is secure, loosen the ponytail base even more with your fingers by pulling the elastic outwards. 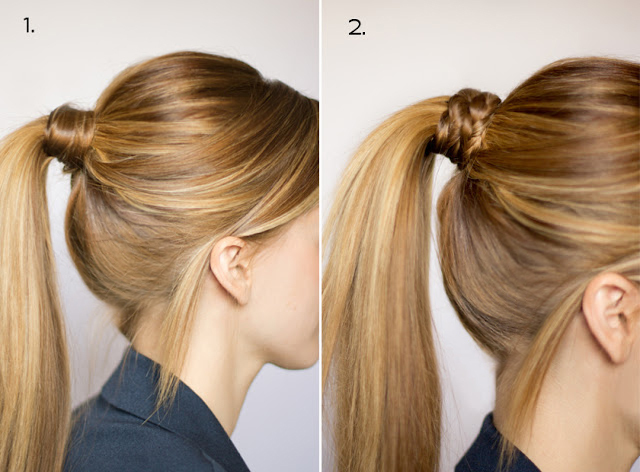 -Starting underneath, put two fingers up through the base of your ponytail, creating a small hole. -Flip the ponytail upwards and pull it down through the hole with your fingers. -Once it's through, pull it tight and smooth out any bumps. -Section out a section of hair that goes from ear to ear and down to the base of your neck. -Clip the top and sides aside for later. -Flip your head upside down, smooth the hair upwards and flat, and do a french braid up the back. -Once the braid is complete, combine it with the rest of your hair and put it in a ponytail as you normally would.